I have never tried ear candling before and as usual, I loudhailed on Twitter asking my Twitterbellas if they have ever tried ear candling before and asked them to share their experiences . ALL the feedback garnered were POSITIVE. @mistydaizy- I tried! Super shiok. 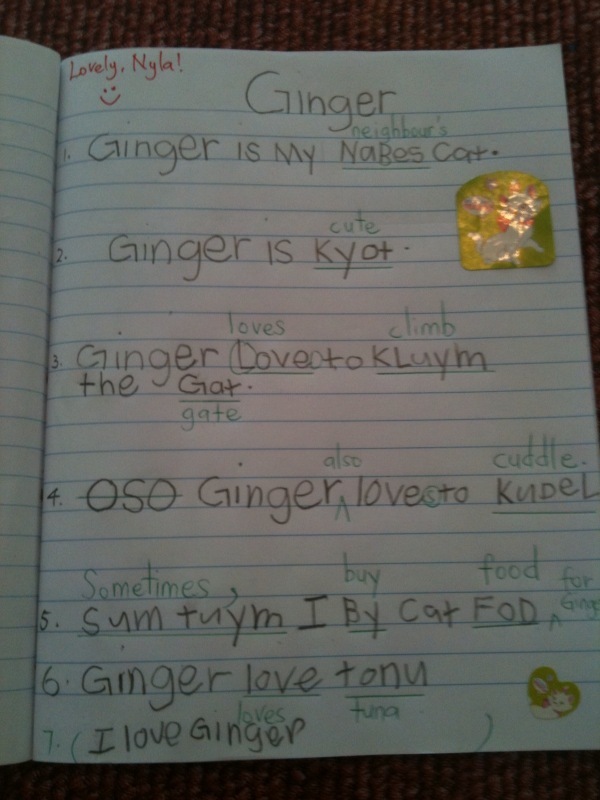 My fiance pun try, tertido sampai berdengkur. 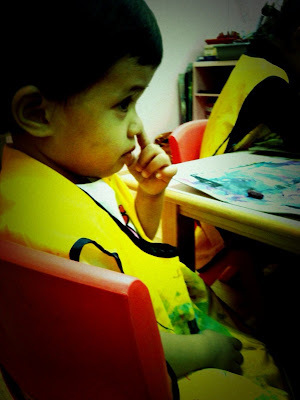 @dianahairul- Marthin boys tried ear candling and they loved it! @Faeza_Aide- Yeah babe! Syiok sampai tertido! One word to desribe, Syiokness! U will love it and want to do it every month! Hehehehe! Notice a 'sleeping' trend? Must be a superbly soothing and relaxing experience hor! Well at least most of the sponge still remained in its original condition. 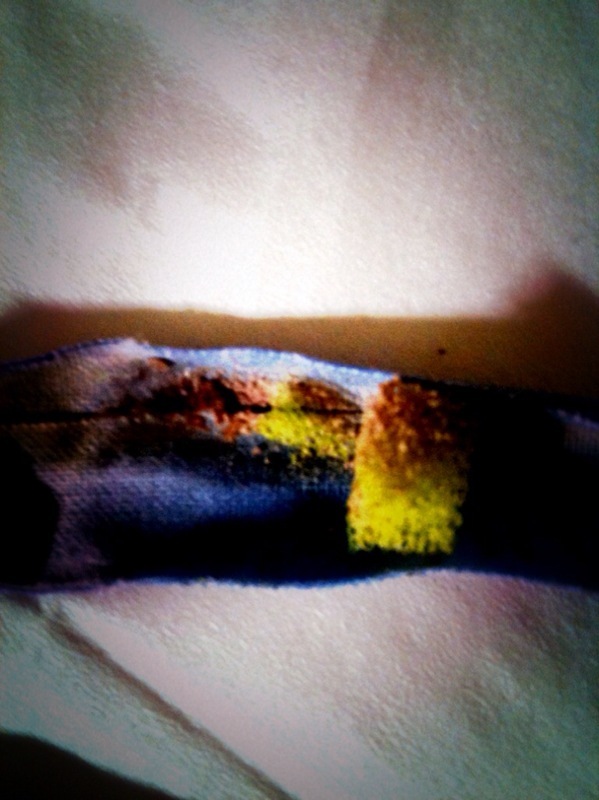 Hmmm the brown part is the chao ta wax..not my taik telinga hor.. Or was it my ear wax? Whooopsie! Aiya, whatever it is, my ears are thoroughly clean now! Hahaha! I've tried and truly, it was SHIOOOkkadUUSSZzzzz! Yes! Now I believe those sleeping beauties! Such an enjoyable process my virgin ear candling experience at Harnies Beauty was! And they say, ear candling is an excellent way to maintain hygiene of ears. I've learnt that by just using ear buds is not sufficient for they only wipe the surfacing wax. So peeps, do give ear candling ($28 only!) at Harnies Beauty a try! I spent a good 3 hours at Harnies Beauty yesterday. I also did the necessary removal of unwanted hair..heee! Waxing for my underarms and legs. Therapist Iza is a meticulous person, making sure I am as togel as possible, battling patiently with my stubborn ingrown hair. 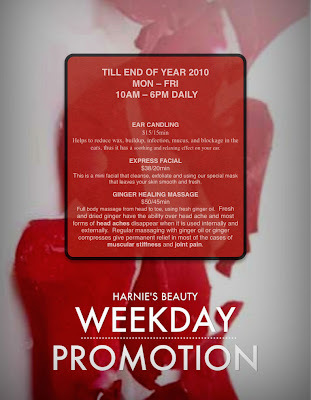 Harnie then noticed that I looked tired and asked if I wanted to try their promotion- Ginger Healing massage. 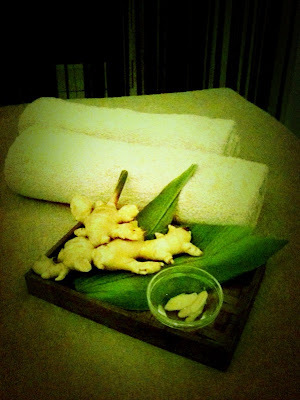 and I sure felt rejuvenated after the ginger healing massage. So ladies, do enjoy this 'worth it!' promotion. New Year coming leh! So must LOOK and FEEL good bebehs! Twittermommas, thank you for participating! Mr E has enjoyed himself so much reading the above 'quotes' he also wants to join the party! My beauty enthusiasts, this entry is for you! Martha Tilaar is in da house, sistas. 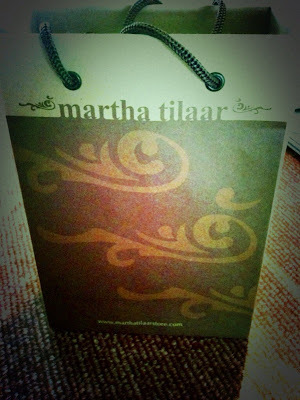 Undoubtedly, Dr Martha Tilaar is THE beauty icon of Indonesia. This successful cosmetics entrepreneur has 'invented' exclusive, traditional and natural products with the highest international quality standards. I didn't get a chance to interview her personally when I was hosting DEWI on Suria some 4 years ago. Truly a dynamic Dewi she is. I remembered being very much inspired when I watched her interview segment and became an avid fan of PAC Cosmetics. And here I am now, given an honourable opportunity to be chosen to try out her products. I feel so privileged indeed! I shrieked with delight when this greeted me at home last week. Just by receiving her product can make me star struck. Siao. What's in da bag, I hear you kepochis ask? Specifically Martha Tilaar's Dewi Sri Spa range with rice extract and essential oils in body care products. I brought along the body wash and body lotion to KL and Genting last week. I for one HATE using those hotel soaps lor. Think those pathetic tiny bars! No smell somemore. Regretted big time though because my mother also decided to boycott the hotel soap and use MY Dewi Sri Spa's White Tea Body Wash AND White Hibiscus Body Lotion. Thanks ah mother. Besides my strong dislike for the mini hotel soaps, I also hate soaps with a way toooo overpowering fragrance. Dewi Sri Spa's White Tea Body Wash is just nice. Sucha gentle but long lasting scent. On top of that, this lovely liquid soap leaves my skin (and my mom's -____-) clean, soft and fresh. 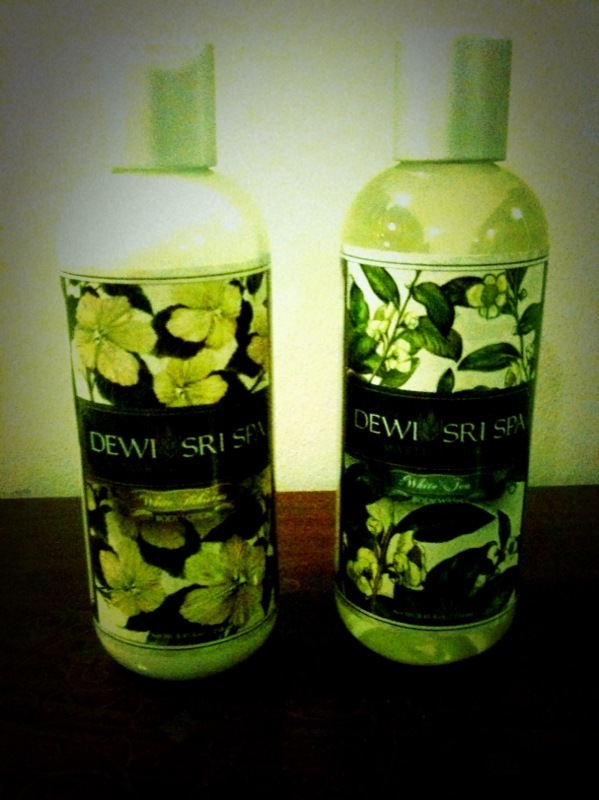 Really, Thank God for Dewi Sri Spa's White Hibiscus Body Lotion. I have been applying this body lotion since last week after every shower. Not only has The White Hibiscus Body Lotion successfully prevented my skin from drying out, it also continues to nourish and protect my skin now that I'm back in sunny Singapore. This gentle moisturizing lotion enriched with rice and hibiscus extracts and Vitamin C definitely promotes beautiful luminescent skin. SPF Sunscreen also protects my skin from ultraviolet exposure. Absolutely loving the soft and smooth feeling and light fragrance of my skin. If you must know, the secret behind the Dewi Sri Spa collection is rice. Through years of research by Dr Martha Tilaar's team, rice extracts are found to contain ingredients that are beneficial to the skin. Rice (Oryza Sative), which is known as a "source of beauty” in Indonesia, contains Vitamin E Tocotrienols with antioxidant effects of 40-60 times, Vitamin B Complex, Gamma Oryzanol, Phytosterol, CoQ10 and Ceramide. Ceramide, among others, moisturizes and increases the skin collagen production, improves skin elasticity, maintains the function of protection and homeostasis of skin in order to brighten clear skin and also prevents premature aging of skin as well as helps the regeneration and development of new cells. I can't wait to visit the store specifically located at Marina Square #02-341. So gonna bring my momsy along! Babesters, you may also wish to visit http://www.marthatilaarshop.com. 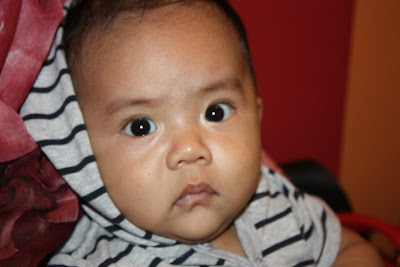 So, the babe has beaten me to it and blogged about our Tanjung Pinang trip over at her blog. I have tonnes of pictures but because nearly the whole day was spent discussing about our splendid experience at Tanjung Pinang for Nyla's blog entry, I am not going to blog about the same topic la ah. Will blog about it soon enough. Well Nyla didn't mention about our 3 days 2 nights 'food festival' since she's not that much of a food lover. Itu gonggongs were so yummy I lost count how many I ate. 1 thing I know is that everytime I popped one into my mouth, I said Bismillah. 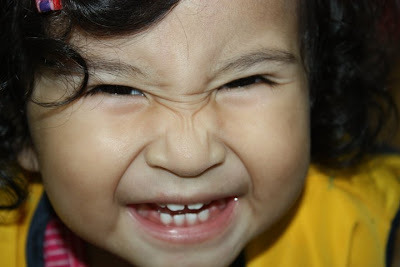 Takot kena food poisoning! Anyhoots, damn the black hair lor. Hair colour's pretty uneven now. Top part je striking red...the bottom part slightly darker...The stylist advised me to bleach but I firmly said no cos I know my hair will surely be damaged one. Enough of Tanjung Pinang stuff. 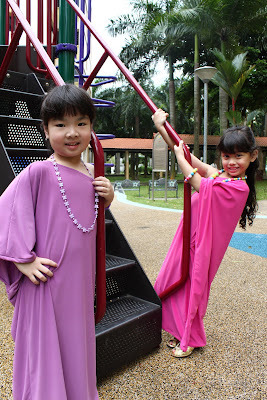 I thought I'd share some cute candid shots of the "Togas R Us" photoshoot at the playground Nyla took with Trisha. 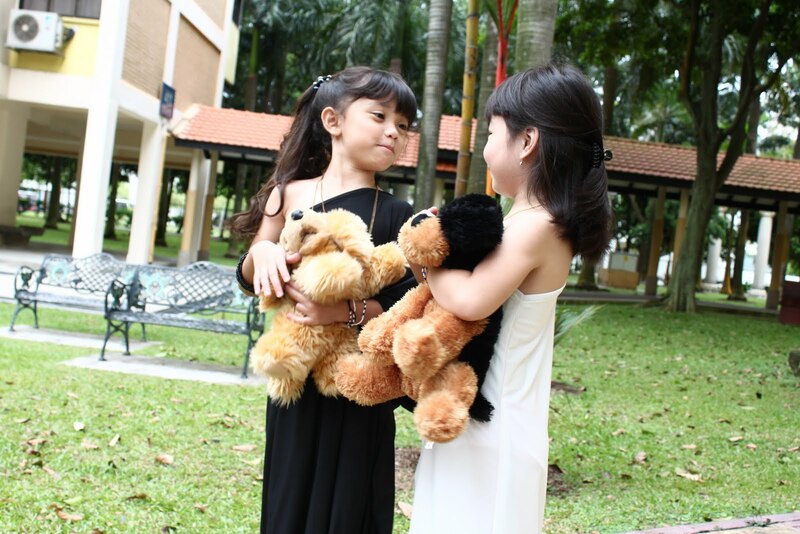 Credits to my very young and 'media enthusiast' neighbour, Hamzah of AnnMzz Creative Production for the cute shots. Such a tech savvy boy he is. And a reliable and responsible one too. Their mom must be so proud. Enjoy the photos peeps. The girls truly had a great time they didn't want the session to end. Nyla is in charge of Togas R Us. So far, she has replied to all the emails with my help of course. 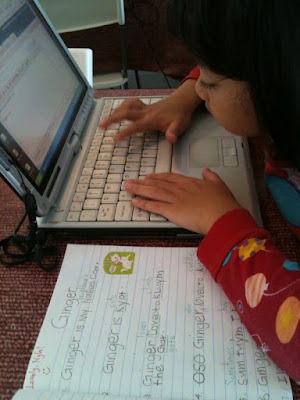 Finalising her email password took us a long time okay. Me: Ok, think of a secret code, Nyla. Me: No. Everyone knows you like Justin Bieber. They will hack. Nyla: Hack means what? Beat me up ah? Me: No, it means to gain illegal access to your emails. So after all the ding dongs, we finally agreed on her password. PLS IF YOU SEE HER, DON'T ASK COS SHE'L TELL one. The only way to be safe in today's rapidly changing environment is to have the knowledge and skills to continually create opportunities of your own. However, in my honest opinion, a degree is now NOT a requirement for success. Just look at Bill Gates. I am also not that sort of parent who sends her child for as many enrichment lessons as possible. 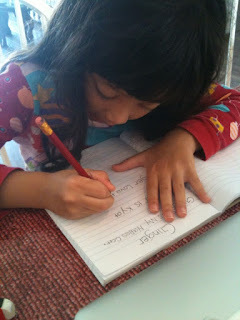 illustrator in the upcoming stories she intends to write. Ever since I quit the civil service to focus on Nyla, I have realised that all along, it has been the other way round. 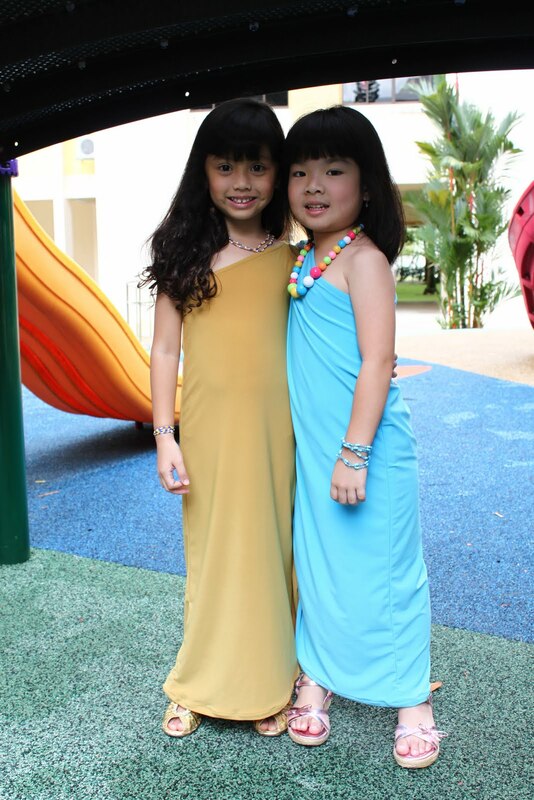 When I modelled for First Lady, she too followed my footsteps and modelled for First Girl. Everytime I am done with tuition, she'll grab the whiteboard marker and Mr E and I (and her soft toys) become her tutees. When I set up the toga tailoring business last July with my mom, she too wanted to be involved by naming the toga pieces. Toothless Black...Cool Mentos Blue..
On top of that she even pestered her Tok Mommy to sew her a toga dress. Of course, her Tok Mommy granted her wish. I think the time has come for Mr E and I to teach Nyla E.E (Entrepreneurial Education) because we firmly believe that every child has the tools to be a successful entrepreneur. They are imaginative....They dream big dreams....They are 'thick skinned'...Hehehe! Mr E and I did touch on this topic at the the marriage symposium 2 weeks ago. On 20 October 2010, I have already loudhailed about the existence of "Togas R Us". Nyla seems excited about her new job and that is a good start! Because we must find our jobs enjoyable - exchanging our innate extraordinary ability for money (income). Not only will Nyla model, she will also handle the toga orders. Hohoho. And how is she going to do that? 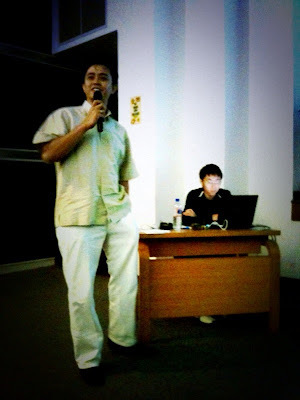 Having contributed as speakers for the topic on "Using New Infocomm Tools to interact with your children" previously, Mr E and I have signed up an email account for Nyla as well as a blog since she loves writing stories. I'd rather she blog than become a couch potato and watch television. 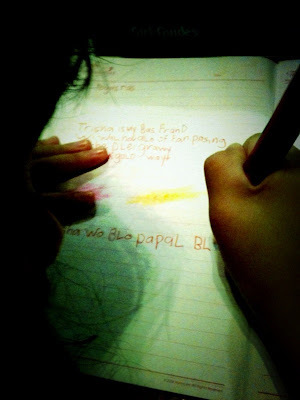 Blogging enhances one's writing skills so in a way, she's writing a compo. Heeeee. However please do not expect lengthy entries k and expect 'hiatus' because really, preschooler's mood swings can be pretty horrid. I'll correct her spelling/punctuation/grammatical errors and then she'll log on to blogger and type her second corrected draft. 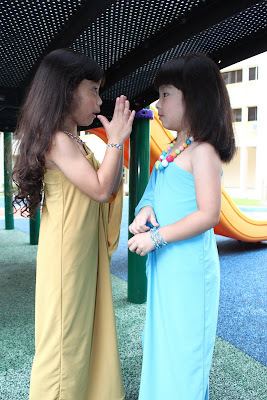 PS: Mommies, when emailing Nyla to place your orders for your girls' togas, I advise you to sit down with your girl(s) and let your babe do the typing. 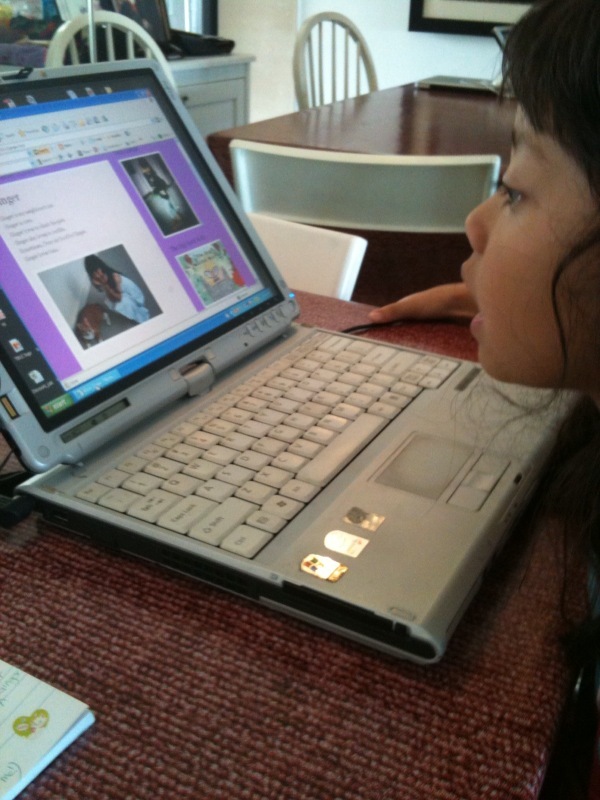 Now, as much as I condone kids to be tech savvy in this new digital age, parents MUST supervise ya. Meanwhile I kapoh one picture from her blog la ah. Too cute. Tooooo irresistable. 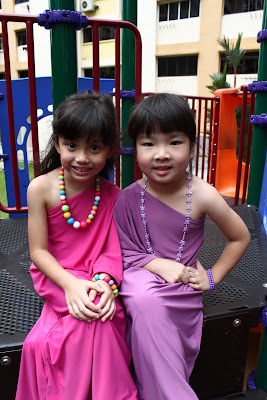 Nyla And her BFF/classmate Trisha Nurdjaja. So mommies, do hand hold your mini BFFs to Nyla's blog and she'll happily process your orders. She was especially excited just now because we will be going for a short getaway soon. 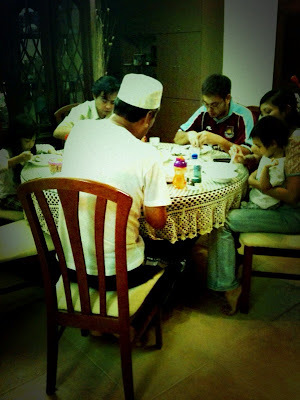 Yeah, our end of year yearly trip with Mr E's family. This time round, nearly 40 of his relatives (including us) will be going. Best abisssss! We just only told Nyla the good news because Mr E and I weren't sure if we will be able to go in the first place, with Mr E being very busy in school and me, with tuition. My Primary 6 Bottoms Uppers have already started tuition 2 weeks ago. So yes, Nyla! Daddy and Mommy will take leave and to Tanjung Pinang, we'll go babe! Kids are real easy to please huh. Seriously, her reaction was as if we told her we will be bringing her to Disneyland lor! Let's do our hair and nails together-gether, my mini BFF and look pretty for Uncle Irfan and Aunty Ray's wedding k when we come back. Busy day ahead. Tuition in the morning. Toga errands during lunchtime followed by another round of playdate with Nyla's friends. 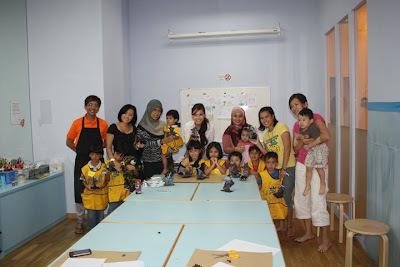 Have signed up all 7 kids for a workshop at the library in the afternoon. 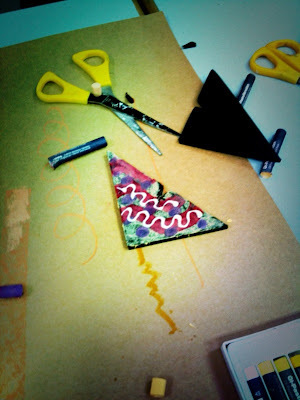 They will be creating pop up cards. Fun stuff. I love the month of December. 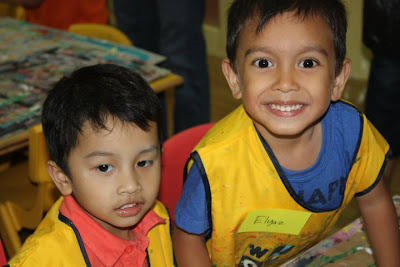 So many fun activities for the kids and us mommies can relack jack. 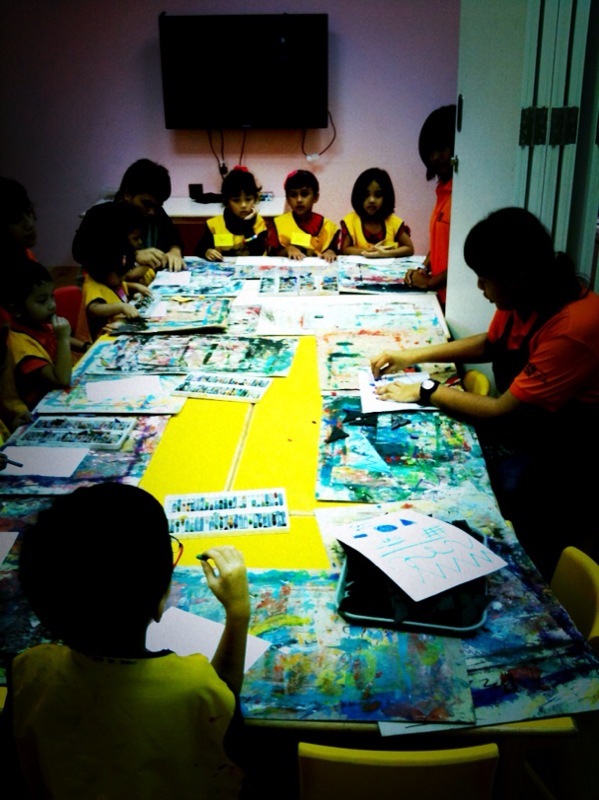 During the Christmas season, WowART Learning Studio will be conducting a series of workshops for kids. Nyla and myself (as well as other mommies and kiddos!) were very fortunate to be invited to its exclusive sneak preview of the workshop. 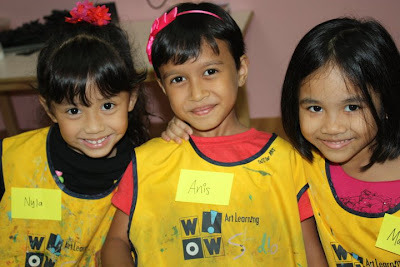 All dressed up for a learning adventure at WowART studio! 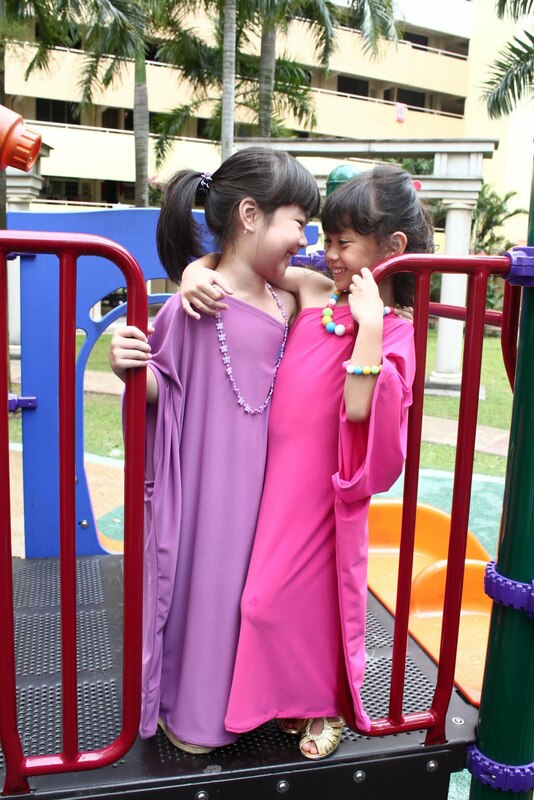 The girls, Nyla, Shiqah and Marsya were very happy to see one another they squeezed themselves together. Cutesy Elisya also joined in the fun. Baby bam bam Ariz was present too! Tis' the season to be jolly lalalalalalalala. Christmas trees we will be makin' lalalalalalla! Yeap, just like the previous session, mommies cannot escape. 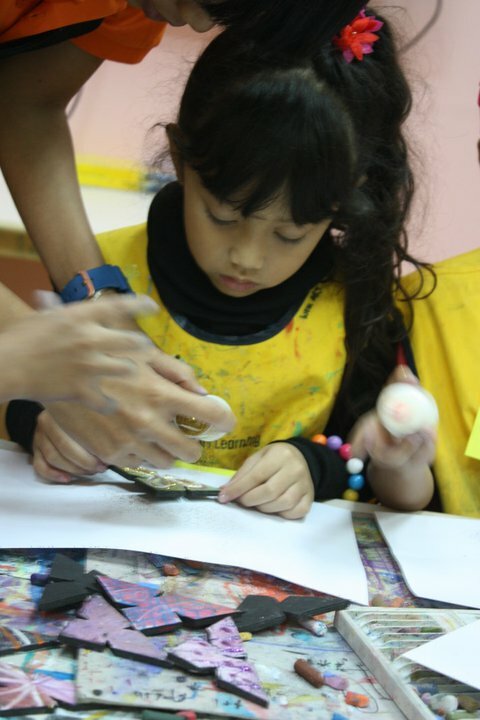 No such thing as kids do art, mommies chit chat outside. Erm, Diana....your flower looks hmmmm...unique. Hint: the sunny side up - telor mata lembu one. Seriously our Art teachers deserve to be shot la dey! Ok ladies, let's get serious now. Ready to make Christmas trees? 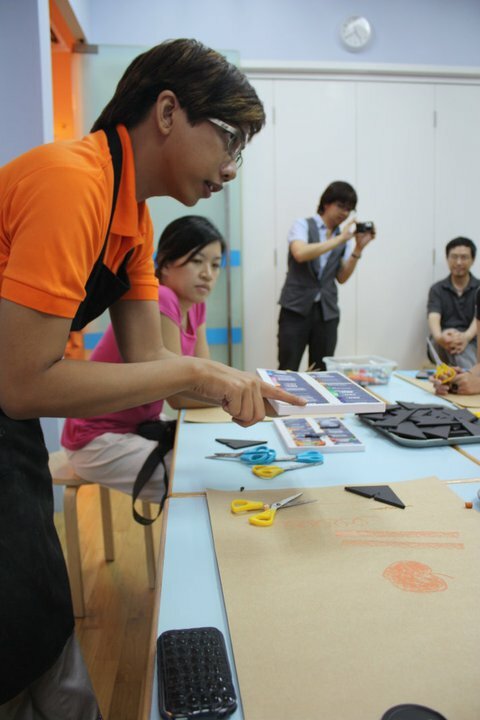 That's our ever so patient and smiley Teacher Gaz! 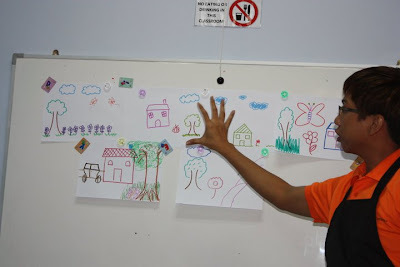 This woman took Art in secondary school and her tree was absolutely beautiful. Judging by this picture, you make an excellent hairdresser too, Kin! While the mommies were laughing away and all, the atmosphere over at the kiddos' room was a total opposite. Our kids were super FOCUSED they put us to shame! We are sooooooo proud of them. I am hence convinced that the WowART's trainers nurture each child's imagination, versatility, self-awareness, motivation, confidence and independence. Di's Marthin boys. Hizqeel sampai tongue ter-twist! 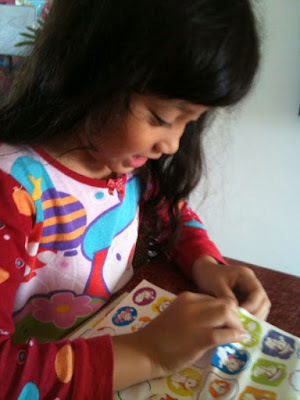 The tripletmom Yati's Jannah looking for inspiration (cari ilham) on how to decorate her Christmas tree. At the same time, thinking of her sisters Sarah and Adawiyah. Another thing I love about WowART is that it's classes are kept small to ensure that every child gets the most out of his learning experience. Us mommies finally serious working on our respective Christmas trees. What I love about making friends with mommies is that we learn from one another. 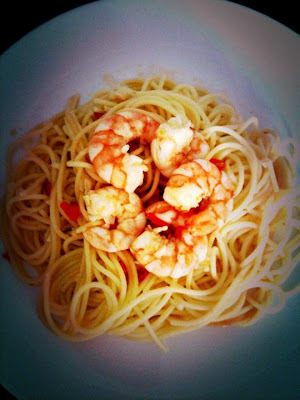 Mother of 4 Yati shared with me her famous prawn Aglio Olio recipe and man, it should seriously be renamed as Aglio Air Liur! I whipped up this spaghetti dish for lunch....SUCCESS. Thanks sis! Share with me some more easy recipes k! Posing with our finished art work! So mommies and daddies, let's not 'lock up' the kids at home ya! It's the holiday season man. 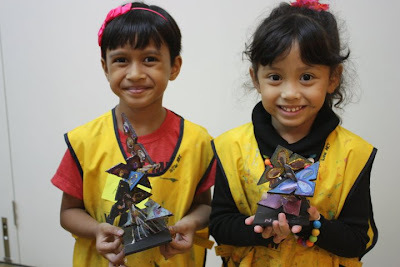 Let them participate in fun activities. 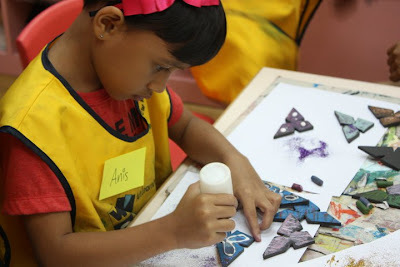 This month, WowART Learning Studio will be conducting a series of workshops for kids, introducing them to the exciting world of art works such as clay handling, glass painting and many many more! 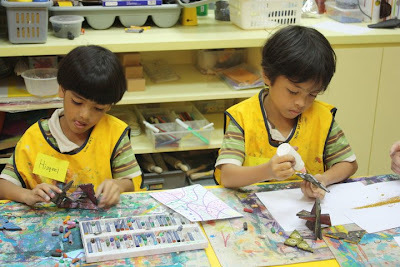 Their courses inspire and nurture children from the ages of 2.5 to 12 years old. 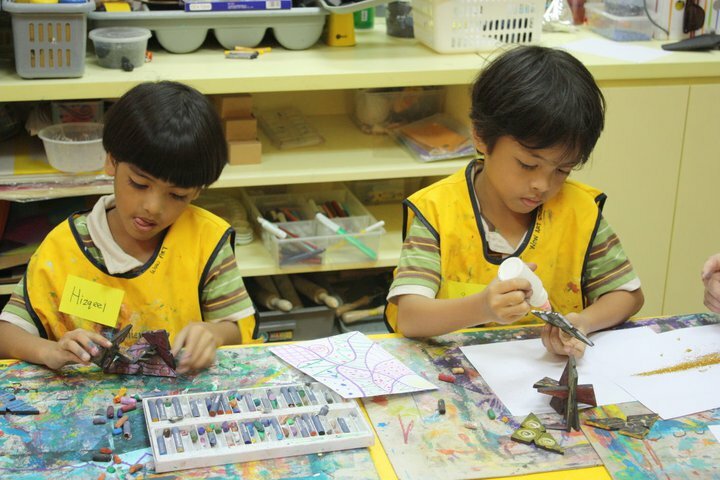 As stated in their website, Art is a fundamental medium that helps children develop a sense of expression, communication and creativity. Trust me, your kids will have a GREAT time. Okie Dokie, Have fun kiddos!